Like Moseley Dance Centre, Le Club Fondue are simply going to be playing the best pop, rock and indie classics from the last six decades. Remember those legendary nights at Moseley Dance Centre? Of course you do, and you loved them didn’t you? We all loved them, they were just a massive cheesy disco with free sweets, but look, we’re all a bit older now, and those nights at MDC are long gone… Don’t you just wish you could do it all again? Well now you can! Some really clever DJ’s from Kings Heath are bringing back the spirit of MDC and the glory days of nightclubs in Birmingham, and selling out their nights at The Hare. 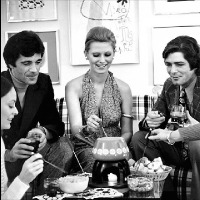 Le Club Fondue (French for The Cheesy Disco) is here! It's the brainchild of some heavyweight (ok, overweight…) old school DJs from Birmingham, (High Fidelity / Silent Noize) who are on a midlife mission to bring back the glory days of nightclubbing, and that means they'll only play stomping dance floor classics and anthems from days gone by, that everyone loves to dance to and sing out at the top of their voices. Like Moseley Dance Centre, we’re simply going to be playing the best pop, rock and indie classics from the last six decades. If it makes you sing and dance, then we’ll probably be playing it. We don’t care if it’s The Bee Gees or De La Soul. Not bothered if it’s Amy Winehouse or Chaka Khan. Uninterested if it’s Rick Astley or James Brown. If it’s a great tune, then it’s in, and unlike many club nights with a ‘serious’ music policy, you can even come and make requests, just like the old days! Think motown, soul and disco. Think pop, indie and rock. Get ready to dance round your handbags and manbags, to tunes from the likes of Blur, Madness, Kylie, Bee Gees, Beyonce, Taylor Swift, The Killers, Katy Perry, Robbie Williams, Take That, The Spice Girls, Wham, Human League, Guns 'n' Roses, Eurythmics, Fleetwood Mac, Pulp, Soft Cell, Dolly Parton, One Direction, Aha, Tom Jones, Jackson 5, The Darkness, McFly, Culture Club, Prince, Tina Turner, Chic, Fat Boy Slim, Earth Wind and Fire, James Brown, Steps, Elvis, Dexy's MidnightRunners, Boney M, Lulu, Elton John, Aretha Franklin, Cher, Supergrass, Duran Duran, Billy Idol, The Beatles, The Kinks, 5ive, David Bowie, Fun, Bonnie Tyler, Amy Winehouse, Madonna, Iggy Pop, Bon Jovi, Queen, Rick Astley, Diana Ross, Abba, Prodigy, Erasure, Phil Collins, Depeche Mode, Girls Aloud, Supergrass, Journey, Will Smith, Rolling Stones, S Club, Beach Boys, Michael Jackson, De La Soul and many more floor filling, song singing, club night anthems!